So, Todd has been out all this week in New Orleans writing and recording for the band’s new record. It’s no secret to those to know me that I can be somewhat of a pessimist about situations in life, but Todd is the biggest easy-going optimist you could ever dream up, so that has helped balance me out over the years. I’m always sad to see him leave (of course), but it does help to think of the time that he’s gone as an opportunity to get some things done on my project list and watch all my tv shows that he hates (Kim and Kourtney Take Miami, anyone??). 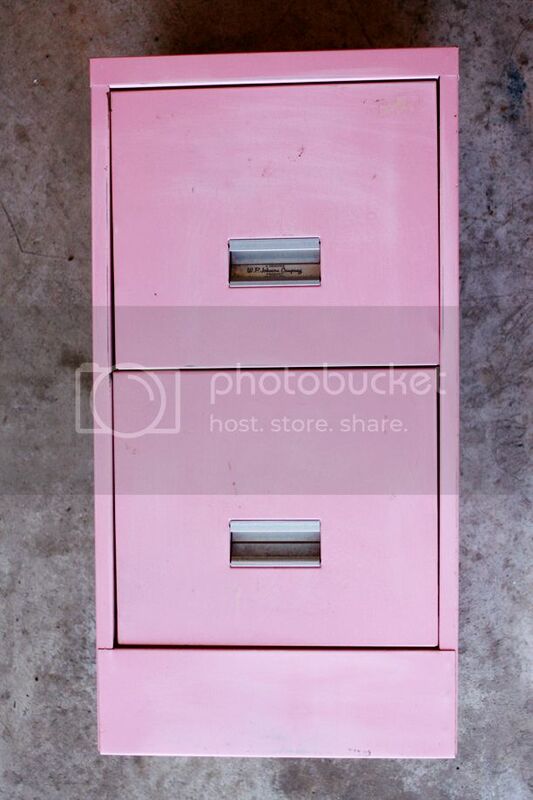 One of those recent projects was this makeover on a filing cabinet I found at the flea market. It came in this lovely pink color that I adored, but the hue didn’t work with its intended locale in the house, so I needed to rethink the paint job. Storage is always an issue in a home (especially in an art studio type of setting), so I decided that this vintage filing cabinet could help me house a good portion of my paints that are currently stuffed out in the garage. All the cabinet needed in prep work was a light coat of sanding with a medium grit sandpaper. Once I wiped down the sanded paint dust, it was ready for the transformation. 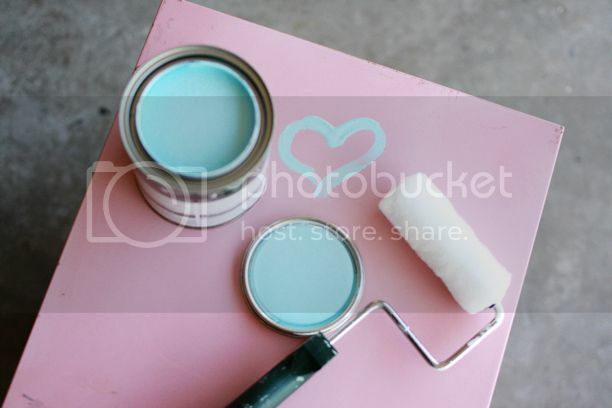 I chose the Glidden color True Turquoise in a latex paint for extra durability and ended up doing two coats for full coverage. Thankfully, I was able to wiggle the drawers out of the cabinet before I painted, which made the whole process much easier. Seriously though, there are few things that I love more than storage that looks good. I left the little company tag on the top drawer to keep some of the vintage charm, but I’m really pleased at how fresh and bright the cabinet turned out. 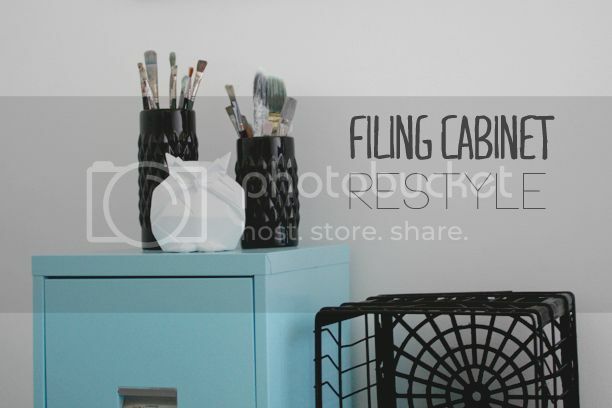 If you need some storage, filing cabinets are a great way to get organized and there are various shapes and sizes all over the flea market world. Todd will be home tomorrow, so I’m trying to finish any projects tonight so we can spend some relaxing time together this weekend. Can’t wait! Categories: HCYMT? 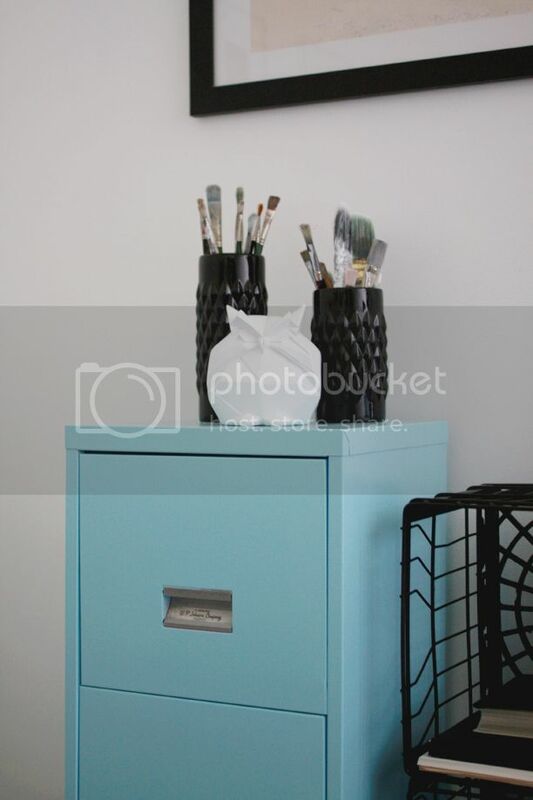 | Tags: diy, filing cabinet | May 16, 2013 by thebandwife. Love this re-style! Super cute!! Also, I love those crates that you have stacked beside the cabinet. I’ve been looking for extra storage for my constantly expanding collection of vinyl. This is perfect because I have an old and bumpy black file cabinet I dug out of Brooklyn and hauled back to my apartment in the city with the hopes of painting it and turning into a cool, old and bumpy file cabinet. I thought to do a graffiti style, with lots of splashes of paint. But I now I feel a solid and simple approach will go more with our black and white office. Now I know what kind of paint to get, and I love that blue! Thank you Gummergal! Yes! Glad you already have one! Love the new color! 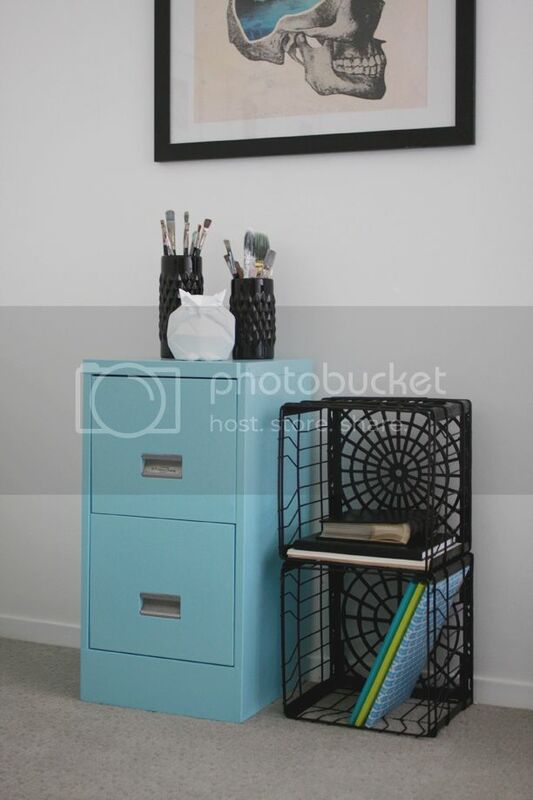 This has inspired me to consider painting my black filing cabinet. ~M. What a perfect paint job- I’m glad to know that ‘found on the side of the road’ faded black isn’t the only colour my filing cabinet can be! Wow, both before and after are cute!! And it is kinda nice to have a chunk of time to get things done while they’re away, isn’t it? My boy’s on tour in the South at the moment- I’ll probably spend most of it organizing and cleaning, while watching Orphan Black and the Mindy Project 🙂 Enjoy the weekend! What a great idea!! 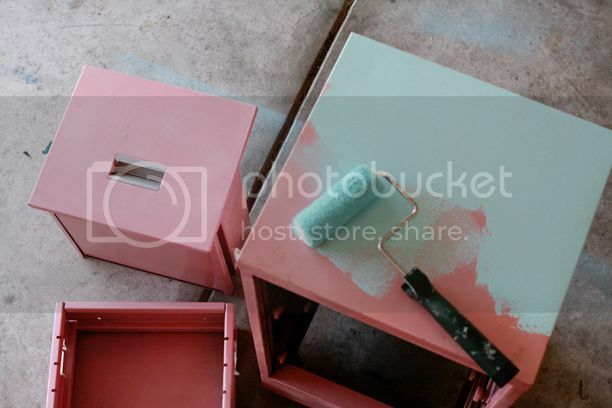 I have an old cabinet in my garage that I can paint it and use it in my computer room, Love the color too!!!!! Where did you find that geometric/awesome owl! ?